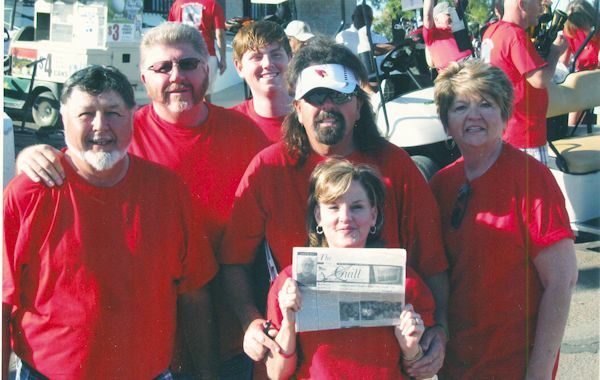 On Saturday, May 11th, 2013, (left to right) Ed Bishop, Mick Bishop, Clinton Bishop, Tom Bishop, Lori Bishop and Helen (Bishop) Robertson took "The Quill" along for the 3rd annual Cody Thomas Bishop Memorial Golf Tournament at the Ken McDonalds Golf Course in Tempe, Arizona. Tom (formerly of Biggsville) and Lori Bishop who have sponsored the Memorial Golf Tournaments after their son, Cody Thomas, was tragically killed by a drunk driver. All proceeds goes to children's programs that are in need.